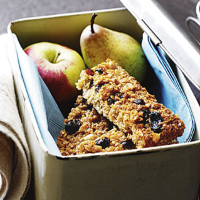 These delicious flapjacks are full of energy-boosting oats, honey, juicy dried fruit and nuts. They're perfect for lunch boxes. Preheat the oven to 180°C, gas mark 4. Place the butter, sugar and honey in a medium pan and heat gently, stirring occasionally, until the butter has melted and the sugar has dissolved. Remove from the heat and stir in the oats, dried fruit and nuts. Press the mixture into a lightly greased 30cm x 20cm x 4cm rectangular non-stick tin and bake in the oven for 20-25 minutes, until golden brown. Allow to cool in the tin for 5 minutes, then score lightly with a knife into 12 bars. Leave to cool completely in the tin before removing. The flapjacks can be stored in an airtight container for up to 4 days. Replace the berries and cherries with an equal amount of chopped dried apricots or dates, for a change of flavour.